On a hike at the Milne Dam Conservation Park in Markham, Ontario, we came upon this Red-tailed Hawk sitting in a tree above the hiking trail. 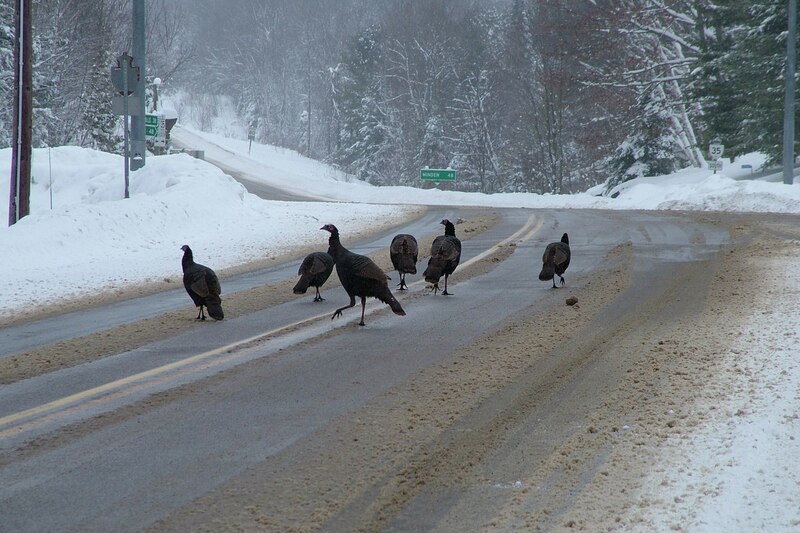 With birds in active spring migration, we figured we would also see many other interesting species, too. The loud croak of a Great Blue Heron took me by surprise as it took flight from a concealed spot along the shore of the water, but I was too slow to capture it in flight. Not long after, the same Great Blue Heron (Ardea herodias) took me by surprise when its silhouette drew my eye to where it was hunched in a tree. Even though Great Blue Herons are the largest heron in Canada, this specimen was no easy thing to pick out, so nicely tucked away in a thicket of branches that were the same color as its body. 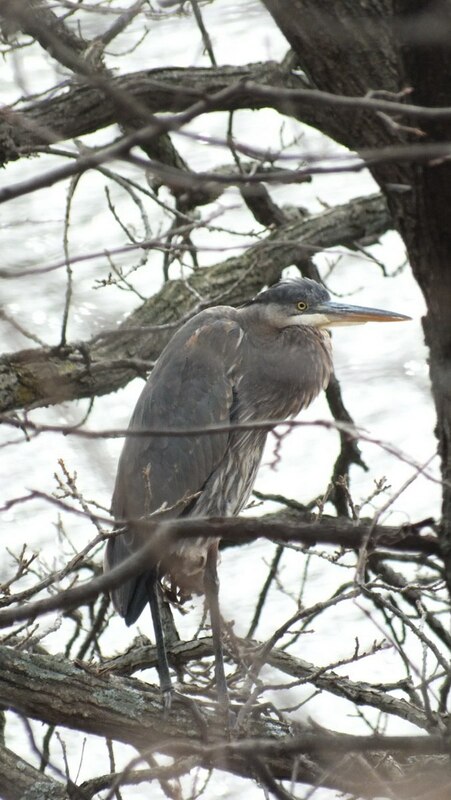 It was unusual, at that time of year, to see it there in the Conservation wetlands as most Great Blue Herons had already migrated south to winter in the southeastern United States. In another part of Milne Park, dangling from a high tree branch, was a Baltimore Oriole’s nest now abandoned for the season. 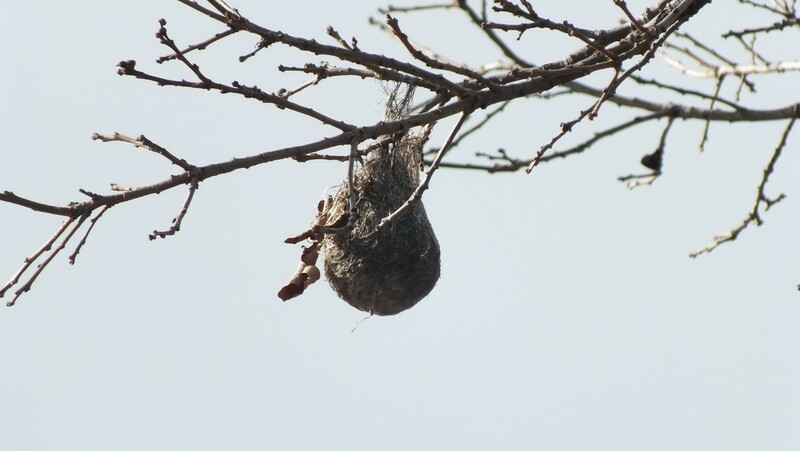 It reminded me of similar bird nests that we had seen in South Africa. The Baltimore Oriole’s nest at Milne Dam Conservation Park was similar in structure to this nest constructed by a Masked Weaver Bird. I took this picture in Kruger National Park, South Africa. 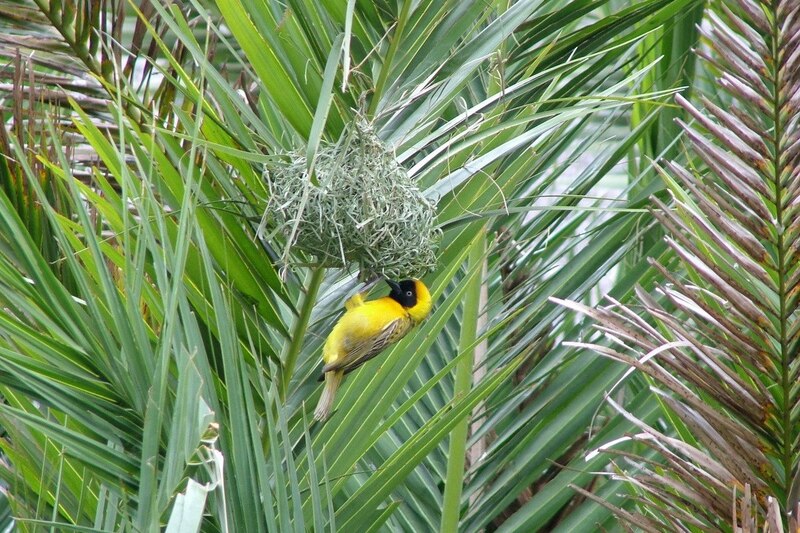 There, one tree might have a dozen Masked Weaver birds working on their individual nests at the same time. 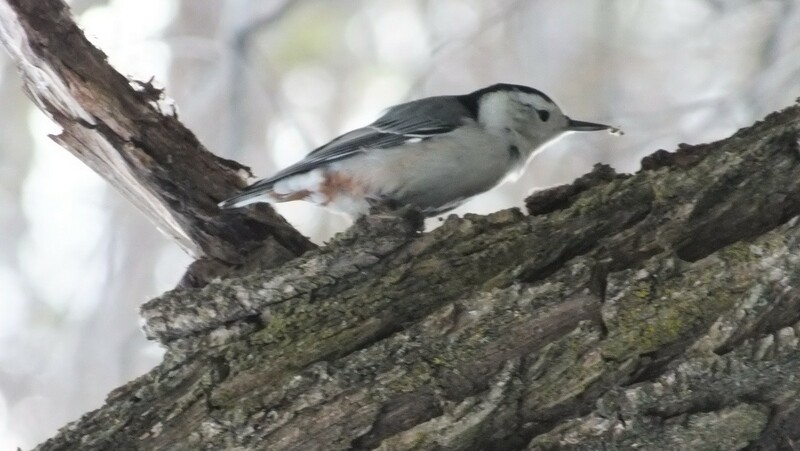 On that chilly November day, a brave White-breasted Nuthatch went about its business searching for food. It was no easy trick to take a picture of this bird! One second, it was going right, then darting left, over then under the tree limb. 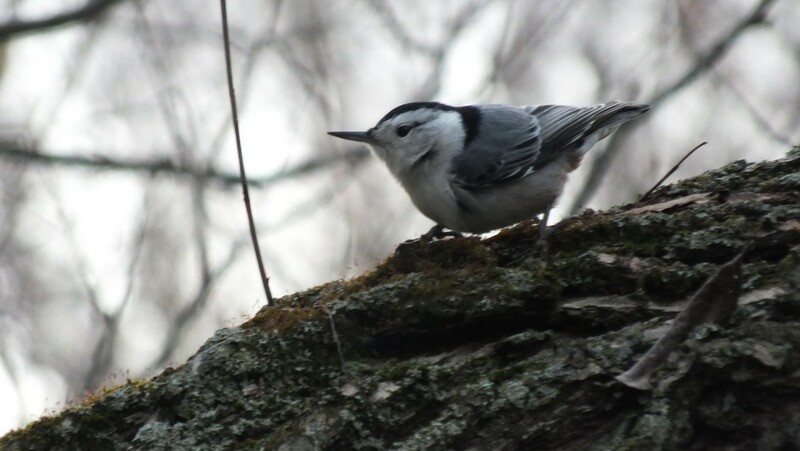 The Nuthatch’s hard work paid off though, and he didn’t come up empty-handed. An insect made a tasty morsel for his insatiable appetite. 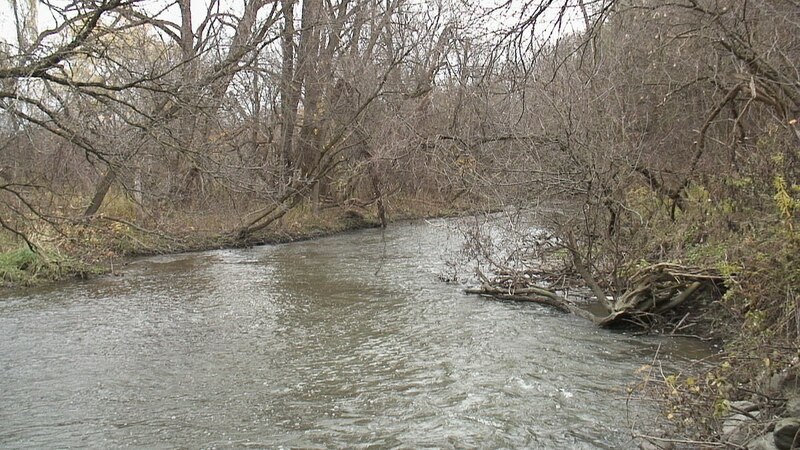 Milne Dam Conservation Park is set along the Rouge River that flows through Markham, Ontario towards Lake Ontario. 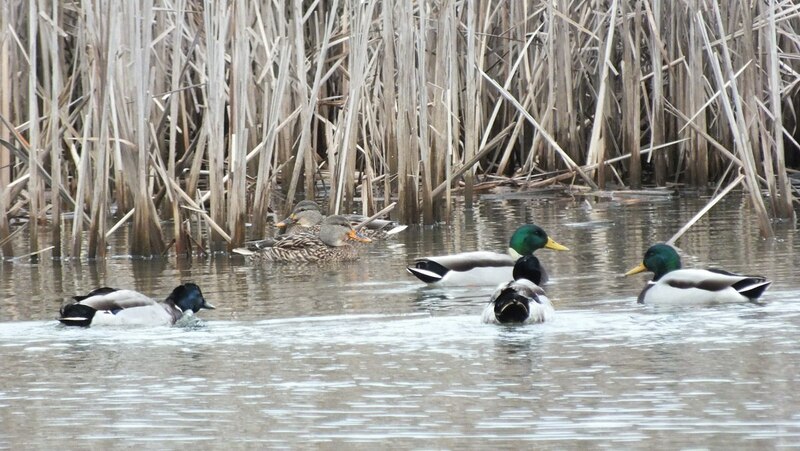 When we visited the park, dozens of Mallard Ducks were enjoying the peaceful backwaters, sheltered from the wind by the bulrushes. 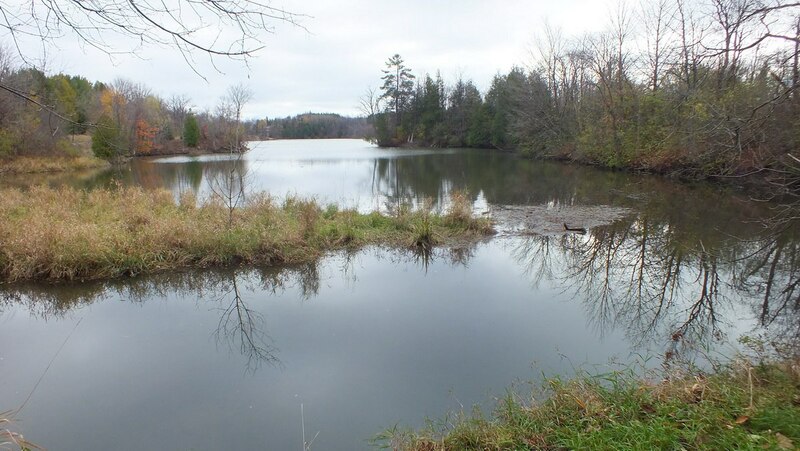 The vast wetlands of Milne Park serve as a natural stopover for thousands of birds heading south for the winter. 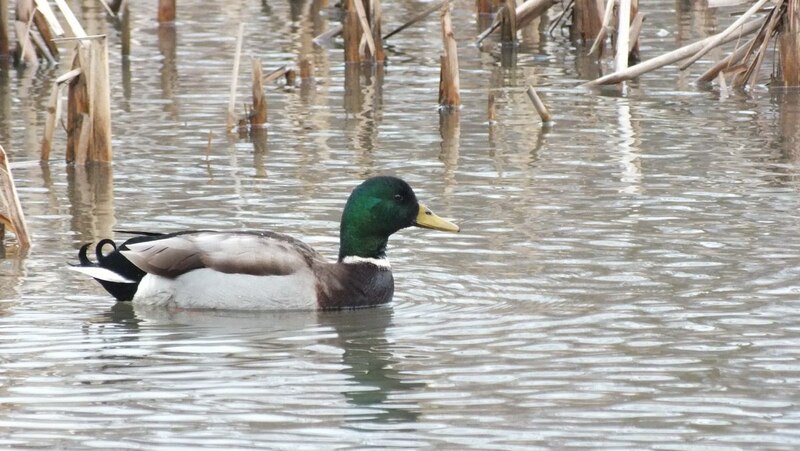 Among those taking a break was this Mallard Duck. At one point, as we crept close to another Great Blue Heron perched in a tall tree, we realized that it had just put off this Red-tailed Hawk, which took flight and landed above me. I have read that stalking a hawk is no easy task, that you have to sneak up on them when they are looking the other way. Well, this Hawk was only looking one way when it landed and that was right at me! Red-tailed Hawks are birds of prey, and as such, they like to land on a high tree or telephone pole from which they can keep an eye out for possible prey moving below. They like to eat mice, birds, large insects, and rabbits such as the one we saw in the forest next to the swamp. 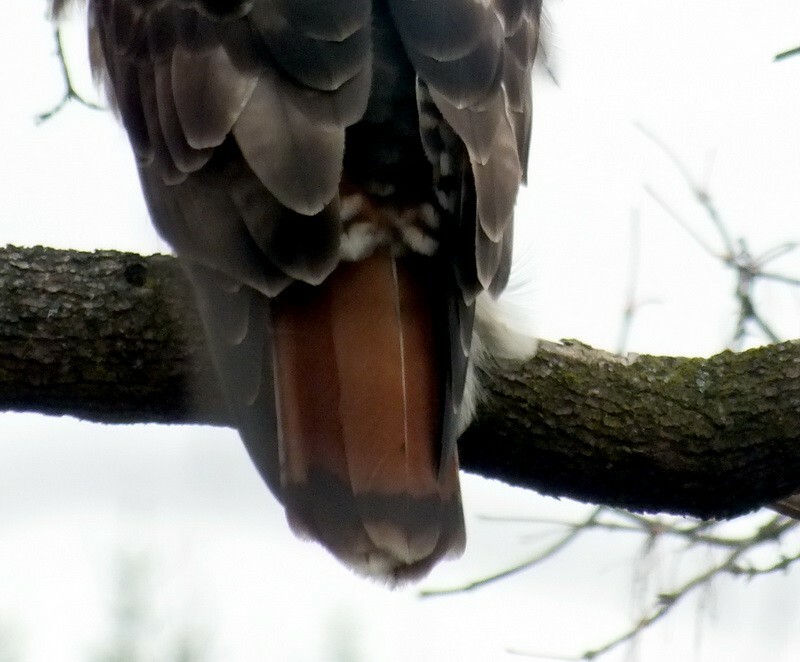 The Red-tailed Hawk is so named because of its striking rust-colored or chestnut red tail feathers. Most hawks used for falconry in North America are Red-tailed Hawks because they are easy to train and also great hunters. As I moved about and took several pictures, this hawk kept his eye trained on me. In this video, the Red-tailed Hawk, having sighted prey, swoops away and then spooks the same Great Blue Heron that forced the hawk from its original perch in the nearby tree. The heron’s eerie prehistoric complaint says it all! 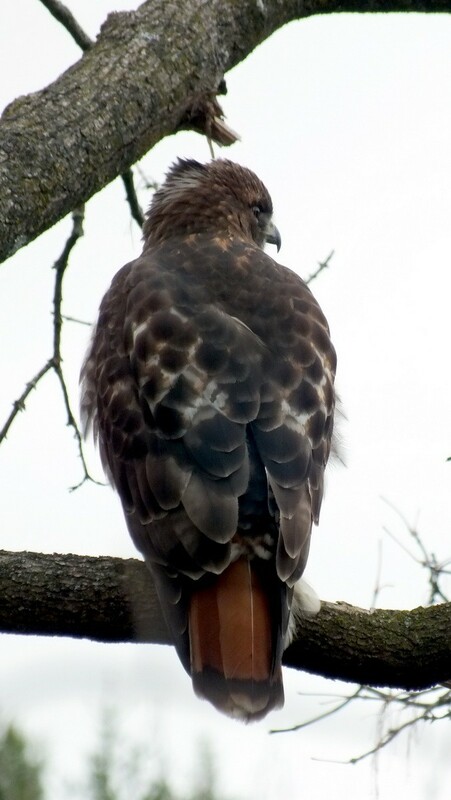 Red-tailed Hawks are protected in North America and Mexico by the Migratory Bird Treaty Act. We felt very lucky to have shared part of the afternoon with this gorgeous bird. What a majestic bird! I found your video and your wonderful blog & photos while searching for video of a Red-tailed hawk seen at Richmond St. W. & Spadina, just the other day. I happened upon several excited people pointing their phone cameras at the top of a parked delivery truck. I walked up just in time to see a large hawk flying away with a pigeon, East on Richmond. 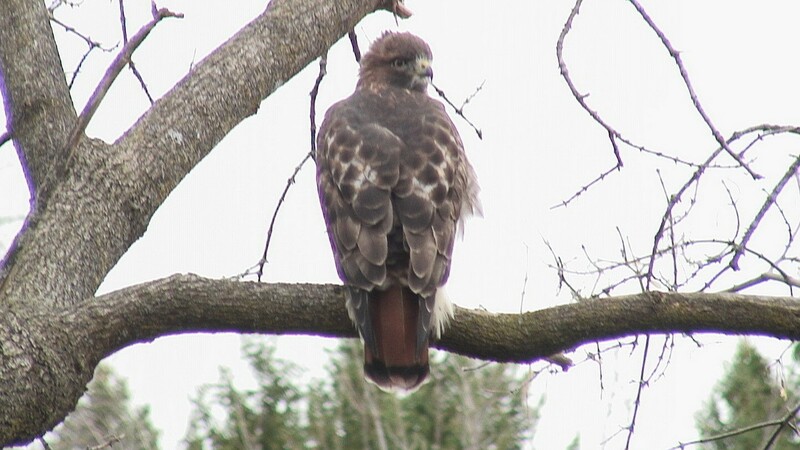 I didn’t get a great look, but the previous week I heard a Red-tailed hawk scream, from my office, in the same area. What a beautiful RTHA. As I am someone from the west, it is always a delight to see the eastern birds. They are very different. Also, i always enjoy seeing a Great Blue Heron photo. They are responsible for my fascination for the bird world. I hope you have more luck like this in future outings. We visited British Columbia a few summers ago, and were thrilled to see so many Bald Eagles. I do follow bird sightings on eBird, and there, I can see that western Canada does have quite a variety of different birds from those we see here in Ontario. Thanks for your comment, Dan. 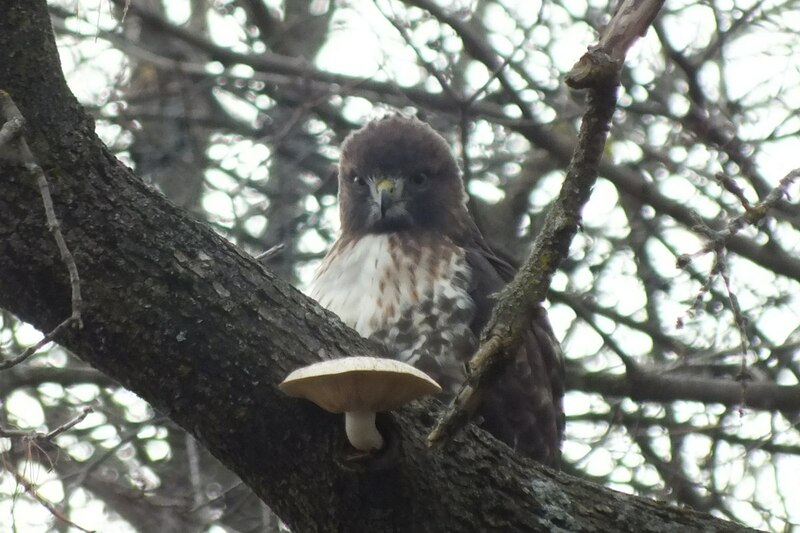 I was so focused on getting pictures of the hawk that I didn’t notice the mushroom at the time. It was only later, when looking at my photographs, that I saw the delicate white fungus. 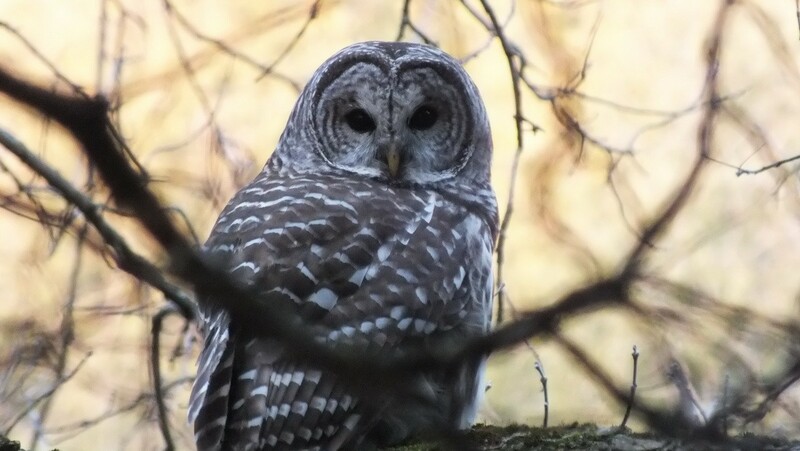 What amazing sighting and photos. And I’m so glad to know you’ve been to Africa because I need help in identifying three birds which someone visiting Tanzania just emailed me. I’ll send them to you thru email. Thanks! Hi Arti. I have been negligent in responding to our “Comments”. I apologize for that. Did you forward the pictures to our email? I will give it my best effort to help you identify the birds from Tanzania, if you haven’t already done so. After reading your blog, I feel as if I’ve been birding this morning! Thank you. I am glad that we have been able to bring our experience to life. I think, by detailing our adventure, it helps people to appreciate the work that goes into active bird watching. 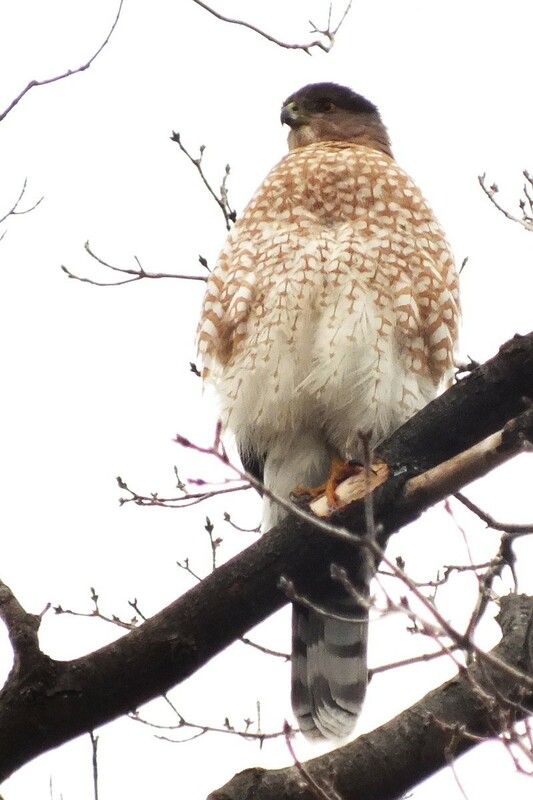 Wow, what great close ups of the hawk and other birds! Thanks for sharing it with me and our Garden blog followers who love birds. Ha, ha. 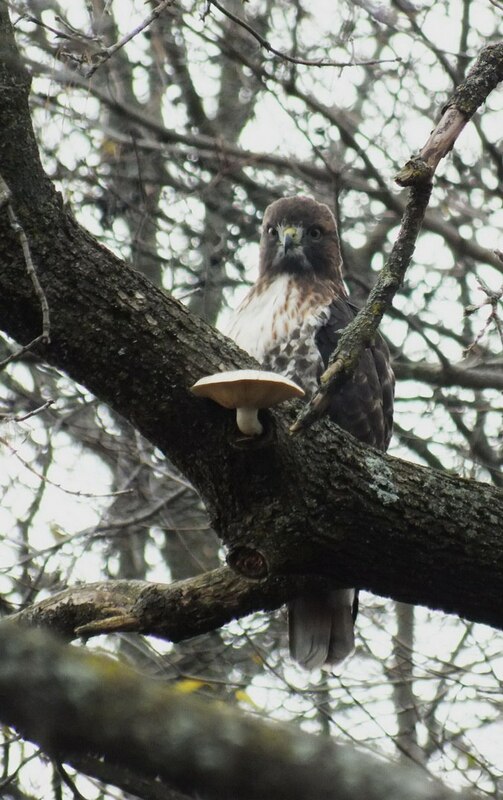 It does look as though the hawk is contemplating the mushroom on the branch of the tree. We were lucky that the hawk landed so close to my head. It provided a great opportunity for close observation.